The TPP-11 implementing legislation is currently under review by the Joint Standing Committee on Treaties, dominated by the government. But community organisations have also succeeded in obtaining a Senate inquiry dominated by Labor and minor parties. The Senate inquiry is hearing evidence in Melbourne today. “The TPP-11 enables global corporations to sue governments over changes to health and environment laws, restricts future government regulation of essential services like education, aged care and energy, and lacks legally enforceable protection for labour rights and the environment. It will mean more temporary migrant workers who are vulnerable to exploitation without first testing if local workers are available,“ said Dr Ranald. Dr Ranald explained that Investor-State Dispute Settlement or ISDS gives special legal rights to foreign investors enabling them to bypass national courts to sue governments for millions of dollars in unfair international tribunals over changes in national law or policy, even if they are in the public interest. There are now over 850 known cases, with increasing numbers against health, environment and even indigenous land rights law and policy. “The European Court of Justice determined in 2017 that ISDS impinged on national sovereignty and that EU member parliaments had to vote separately on ISDS provisions in trade agreements. The EU fears that strong public opposition to ISDS will scuttle trade agreements. It is now pursuing a “fast track” process for agreements without ISDS. The recently-begun EU-Australia FTA talks will not include ISDS, but the Australian government is still supporting it in the TPP-11,” said Dr Ranald. “Even if governments win ISDS cases, it takes years and tens of millions of dollars in legal costs to defend them. The US Philip Morris tobacco company shifted some assets to Hong Kong and used an obscure Hong Kong investment agreement to sue the Australian government over plain packaging legislation. It took an ISDS tribunal over four years to decide that Philip Morris was not a Hong Kong company. It took another two years for the tribunal to award costs, which were blacked out in its decision. It took an FOI case by Senator Rex Patrick to reveal that the Australian legal costs were $39 million,” said Dr Ranald. “The TPP-11 treats regulation of essential services as if it were a tariff, freezing it at current levels and aiming to reduce it in future — known as the ‘ratchet’ structure. This could prevent governments from responding to situations requiring new regulation like the evidence emerging from the banking Royal Commission, or the need for new energy regulation to deal with climate change like the National Energy Guarantee. It could also prevent governments from reversing privatisation disasters like the deregulation and privatisation of technical and further education services, and privatisation of hospitals,” explained Dr Ranald. 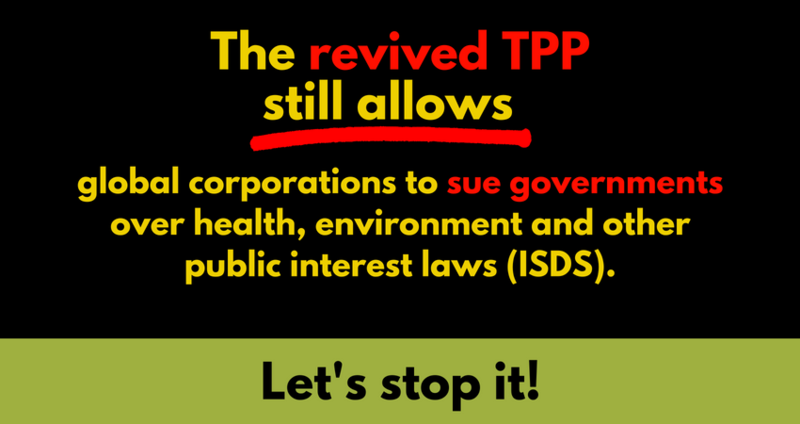 “Labor, the Greens and the Centre Alliance all have strong policies against ISDS and other harmful aspects of the TPP. They and independents have a majority in the Senate. We are calling on them to implement their policies by saying no to the TPP-11 implementing legislation in the Senate,” said Dr Ranald.